Philip Yancey did it again with his book on prayer. His book The Jesus I Never Knew is the best book I have read on Jesus. His book, What’s So Amazing About Grace? is the best book I have read about grace. His book, Prayer: Does it make any difference? (Zondervan, 2006) is the best book I have read on prayer. That is a strong statement for me to make, even as a person who loves the writings of Philip Yancey. I have read dozens of great books on prayer, including great books by people like Richard Foster, Ole Hallesby, Bill Hybels and Oswald Chambers. What sets Yancey’s book apart is his brutal honesty about the struggles people have with prayer, balanced with inspiring stories of how prayer has changed people’s lives. Yancey is particularly self-effacing about his own struggles with prayer and his feelings of inadequacy in failing to pray. Yet by the end of the book, it is apparent that Yancey is much more of a prayer warrior than he admits at first. The books’ 22 chapters are divided into five parts. Part One, “Keeping Company with God,” explores what prayer is. He points out that Jesus “virtually invented private prayer” (p. 63). Part Two, “Unraveling the Mysteries,” discusses frustrations and questions that people have about the effectiveness of prayer. He gives a disarmingly profound answer to those who ask why we should bother to pray when some prayers seem unanswered: “Why pray? Because Jesus did” (p. 78). Later in the book he gives another simple but true answer: “Why pray? God likes to be asked” (p. 143). Part Three, “The Language of Prayer,” discusses how to pray. He gives great practical advice on handling distractions to prayer, and reminds the reader that there is no right way to pray, because different styles of prayer fit different personalities. “Keep it simple, keep it honest, and keep it up” he advises (p. 191). Part Four, “Prayer Dilemmas,” returns to questions people have about prayer, especially unanswered prayer. I would disagree slightly with his defintion of “unanswered prayer,” as he includes in that definition prayers that receive a “no” answer. Yancey’s approach to prayer for physical healing is balanced and insightful, as he reveals scientific research showing healing that cannot be explained, while recognizing the importance of using medicine and how God usually works through natural processes. Part Five, “The Practice of Prayer,” provides motivation for faithful praying. Yancey’s writing includes frequent illustrations from a variety of sources, from popular culture to literature to world history. Being a famous author and editor for Christianity Today magazine, Yancey has received many letters about prayer, and he shares this correspondence throughout the book. One unique quality about this book is that each chapter includes a couple of sidebars written by others, sharing personal experiences in prayer. For example, on p. 224-225 a prostitute whose prayer for deliverence resulted in her miraculous salvation. Although each sidebar story can be read alone, they relate to the chapters where they are inserted. I disagree with Yancey in chapter 7, when he discusses Abraham’s prayer that “changed” God’s mind. Yancey does not notice that Genesis 18:33 says that it is God who ended the conversation with Abraham, not Abraham with God, so God did not change His mind. Also, I believe that Yancey misinterprets Job 21:15 on p. 95. There he says that Job asks “What would we gain by praying to him?” However, the context of the chapter implies that Job quotes the wicked in this passage; Job does not say that he himself questions prayer. It is remarkable that these were the only two places that I disagreed with Yancey, because he makes bold and strong statements throughout the book. I am sure many people will be offended or disagree with some things he said, just because he asserts so many strong opinions. 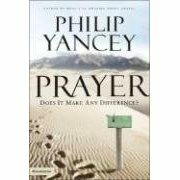 But this is one of the values of the book: Yancey stimulates you to think deeply about prayer, and challenges your preconceived notions. Yet he does so while remaining fiercely loyal to the Bible’s teachings on prayer. In summary, this book is destined to be a classic book on prayer, useful for group study or personal review and study over and over again. Posted on February 28, 2012, in Books, Books, Prayer and tagged books, faith, prayer, religion, Yancey. Bookmark the permalink. Leave a comment.